#AlbisRide is a memorial ride for all those bike riders lost on our roads through careless actions of motorists. In the name of Alberto Paulon but in memory of so many more. This ride is a 3 kilometre trek down Sydney Rd finishing at Bell St where you can disperse and go home. With more than 3000 riders on the road, all on their different modes of transport, it is a show of solidarity. We invite office groups and racing teams in their colours or uniforms, we invite those on cargo bikes, bike share, the weekend rattler and the high end racer. This is a ride for everyone. 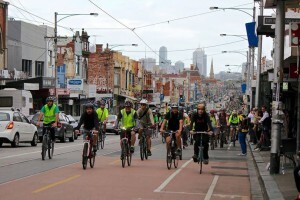 Previous Event:RIDING IN MELBOURNE: PERCEIVED FEAR OR REAL RISK- Is our fear of riding holding us back?